Wrap your room with easy alternatives to shiplap for that modern farmhouse look you’ve been swooning for without having to put in the amount of work or spending too much. Cladding your wall interior with shiplap has become a craze in the world of interior design. It’s not only affordable and easy to install, but it’s also one of the best ways to dramatically revamp any room of the house or add visual interest. The shiplap bandwagon has become such a craze that you won’t just see these traditional wooden boards in barns and sheds but even in modern farmhouses or countryfied home interiors. The groove cut that gives it a unique appearance, however, also means that dust can easily settle in the gaps and inevitably make the boards look dirty. The boards should also be properly installed or else moisture will seep in that will lead to warp or rot. If you want to get that shiplap look for your room interior but can’t commit to installing wood paneling to your room, you need to scroll down below to check out what easy options you have for charming or rustic alternatives to shiplap. Everyone knows how popular shiplap has become an interior design material. People are using it in many unique and interesting ways. As good as it is, there are still plenty of alternatives that you can consider using instead. Working with shiplap can take a bit of effort, and you might want something that is a little more straightforward such as wallpaper. The good thing about wallpaper is that it is very versatile. You’ll be able to buy different colors of wallpaper and you can even purchase some interesting patterns. The wallpaper can wind up looking quite elegant or it can look somewhat rustic. You’ll be able to achieve many different types of looks if you choose to make use of wallpaper in your home. Wallpaper is generally easy to work with. You will be able to buy everything that you need and get the wallpaper placed in your home swiftly. There will be several colors and patterns for you to peruse before you make your purchasing decision. Wallpaper is a practical option that will be useful for many different styles of home design. Wallpaper can be a bit of an annoyance when you decide to change things up again. Removing wallpaper from your walls entirely can wind up being frustrating. It isn’t necessarily difficult, but it can be a bit of a process. There are also people who don’t think wallpaper seems classy enough, so it may not fit your personal sense of style, depending on your sensibilities. Tile walls can actually be a really interesting shiplap alternative. There are many different types of tiles out there. The different tiles will have unique colors and even different textures. They will be able to combine to create a wall that looks truly unique in your living space. Installing the tile can be somewhat time-consuming, especially if you have never worked with tile before. You can choose to have professionals help you install your tile, but you should be able to install tiles by yourself without too much of a hassle. Many people decide to use backsplash tiles to really help create an interesting space. It can work just like shiplap in that it will draw the attention of the eye and stand out from the rest of the room. You will have several types of tile that you can choose from. Taking your time to pick out the exact color that will work well in your living space makes a lot of sense. You’ll even be able to pick out tiles that have a particular type of texture if you choose to do so. Most people are really pleased when they decide to go with tile instead of shiplap, so it is worth your consideration. Some of the nicer tile options may be a little bit on the pricey side. Also, installing tile can take a fair bit of your time. If you are a busy individual, then tackling a project such as this by yourself might be a little arduous. You could turn to professionals for help, but that would significantly increase your costs. Molding is a tried and true design option that will look very nice inside your home. The interesting thing about molding is that it winds up having a very classic feel. You will be able to achieve a very traditional look if you decide to make use of molding. Some people also choose to combine modern elements in their home along with the molding to create something unique. If you have a wall with a fireplace and mantle on it, then this option is really going to fit in well. Using molding on that wall will really give you that classic vibe that you are going for. If you don’t like traditional styles such as this, then you are probably better off turning elsewhere. This is a good shiplap alternative that can give you a classic look that can still feel very clean and sleek. Molding can look incredible if you do it right. If you want to achieve a traditional look that will come across as classy and sleek, then you will love molding. It really does have a completely different vibe than shiplap, but that is what gives it its charm. You’ll be able to make a really nice wall that will look fantastic in your home. Some of the nicer molding options may be a bit on the expensive side. Aside from this, molding is really good for the people who enjoy this type of look. You should know that molding isn’t as versatile as some of the other options. You won’t be able to pair it with as many other styles while still achieving a pleasant balance. Make sure that you want this before proceeding. If you want to make your house feel a bit bolder than usual, then you could consider using stenciling as a shiplap alternative. Stenciling can be a little bit difficult for people who aren’t creative or artistic. 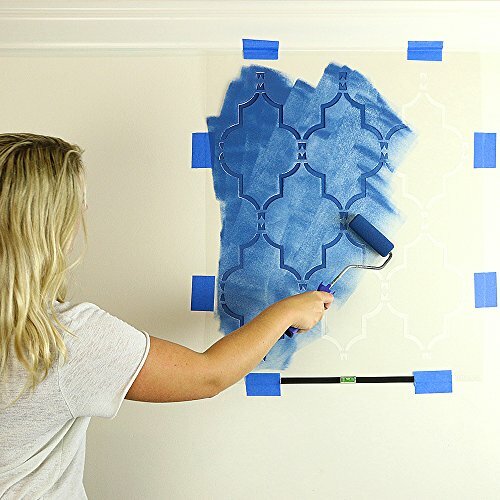 If you have a little bit of art living inside of you, then you’ll enjoy stenciling your walls. You can add flourishes to your walls or even your ceiling, and this will completely change how any room looks. When this is being used as a shiplap alternative, it is often used to apply patterns to a certain wall. You could decide to add geometric patterns to your wall or you could try to make a wall with leopard spots. There are plenty of different things that you can achieve using stenciling. If this idea appeals to you, then it might actually be one of the most versatile, as it is only limited by your own creativity. Making use of stenciling can actually be very fun for creative individuals. This is a shiplap alternative that can definitely make your room look different. You’ll be able to design things in such a way that your living space feels really vibrant and colorful. It shouldn’t be too difficult to accomplish, although it will be a bit of a time investment. This may not be a method that will appeal to everyone. It isn’t exactly a straightforward thing and you will need some ideas. If you don’t have any creative ideas for what to do with the stenciling, then you may be better off going with another method. This appeals to people who want to take the time to implement their own creative ideas, and it won’t be something that will get finished quickly. If you want to have an easier shiplap alternative, then going with something such as tile or wallpaper will be better. You are probably familiar with the idea of creating an accent wall. Many people have been making accent walls for years, and they can help to make a room feel more interesting than it would otherwise be. In a way, shiplap and the other shiplap alternatives are all accent walls that use different means to accomplish the same thing. You can use a little bit of paint to make an accent wall as easily as possible. If you have an entirely white room, then you could paint one of the walls light blue as an accent color. This will draw attention to that wall and you can display things on it that you want people to look at. It’s a good idea and it won’t be hard at all to complete. This is likely the simplest shiplap alternative that you could make use of, so you should think about whether or not it will work for your situation. Those who are looking for a solution for the entire room and not just one wall could try to make bolder color choices, too. Sometimes, interesting combinations of colors can accomplish the same thing as accentuating elements such as shiplap or molding. The idea is to bring attention to the room and make it feel interesting. Adding some color can do this and all you will need is some paint to get the job done. It won’t cost you too much money at all to buy some nice paint. You’ll be able to choose whether or not you want to make a glossy accent wall or if you would prefer to keep things matte. It will definitely alter the look of your living space and draw attention to the wall that you are painting. If you are looking for shiplap alternatives because you want to make a certain room stand out, then this option can help you achieve this without forcing you to spend a lot of money. Not everyone is a fan of the idea of accent colors. There are people who think that it makes a room look unnatural and off-putting. This isn’t necessarily going to be the opinion of everyone, but it has both fans and detractors. You will need to determine how you feel about the idea personally before moving forward.